Share this product and receive a $0.39 sharing discount. This acrylic slide is to be used with the Photo Light Boxes. The Photo Light Boxes and the Special Photo Treatment Slides are sold separately. This particular insert is to be used without a photo. 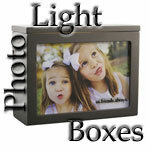 See ALL Photo Light Boxes and Inserts.